When we think of exotic destinations, it’s easy to think of luxury, expensive hotels/resorts and that sort of deal, but it really doesn’t have to be that way. This list of affordable exotic destinations should provide you with a good idea of where you can go when you’re tired of the same ol’ same ol’. If you want to get the most value for your money, make sure you stay out of/spend little time in Bangkok. While the bustling capital is a thing worth experiencing in and of itself, accommodation and food is much cheaper in other places in Thailand, and there are a lot more interesting things to see. For example, the featured image is from Khao Phing Kan, also known as James Bond’s island. Also, many places in Thailand allow you to get up close and personal with Tigers, so if that’s on your bucket list, Thailand is just the place for crossing it off. (Picture credit: Arian Zwegers) You might be surprised to learn that Indonesia is the 4th most populated Country in the world, with almost 240 million people inhabitants. This fact, combined with the many small islands that make up the country, makes it a completely different scenery from what most of us are used to. With options like admiring huge active volcanoes from afar, visit what was recently a completely isolated people in Baliem Valley, experience bustling trade districts, the traditional dance performance of Legong(picture), or relax on the beac, it’s hard to go wrong. (Picture credit: Hadi Zaher) At this point you’re probably not surprised that Malaysia made the list. Kuala Lumpur is the most popular destination, and with some cuts, like not staying in a premier hotel, it’s possible to do a longer stay on a budget. The picture is from Batu Caves, a series of caves and cave temples located just north of the capital. Again the options are many, and you can choose to have a very multi-faceted trip if you want to. One thing you should keep in mind is that Malaysia has a primarily Muslim population, so making an effort to not offend them by the way you dress will keep you out of trouble, and might even earn you that little extra bit of good-will you need to have an amazing experience. (Picture credit: Shankar S.) While perhaps being most famous for cheap labor, the Philippines is a great destination for backpackers and budget travelers in general. Not only is it a haven for budget divers and beach people in general, you can also go to see the stunning Banaue Rice Terraces, or the monstrous Mayon volcano, or you could even take a trip through the Puerto Princesa underground river, one of the new 7 wonders of nature. With some suggested daily budgets going as low as 15-20$ per day and even lower, it’s a no-brainer for the sun deprived, broke student. (Photo credit: Visionn Photo) Although it’s probably not the first country that comes to mind when you hear “exotic,” Albania has some of the cheapest costs of living of all the countries in Europe. And its safety, culture, and the many beautiful beaches, for example Ksamil Beach in the picture above, makes it an ideal location for someone who wants maximum return on their dollar. (Photo credit: Dennis Jarvis) Another East European country where you get a lot of value for your money is Bulgaria. While some of the beach towns have become infamous party towns that are infested with lowlifes who prey on the drunk tourists, there are other more peaceful locations that can have you living the relaxing beach life on a budget. 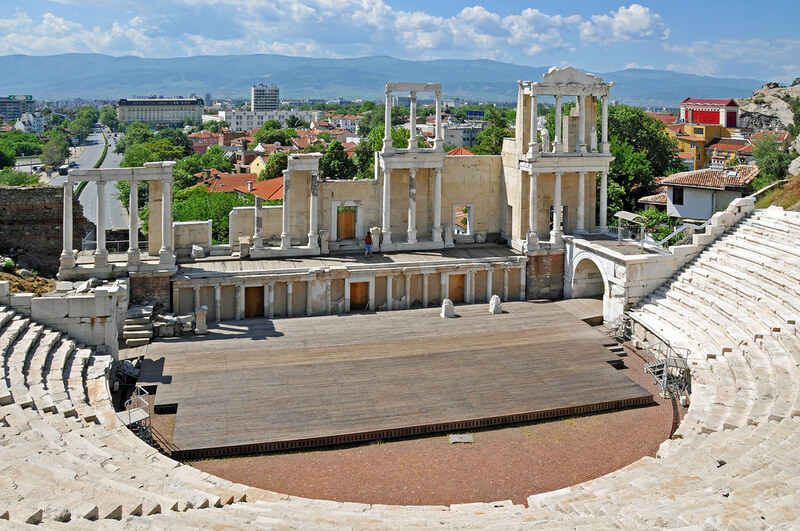 Or you could even visit Plovdiv and see some roman ruins(picture) if that’s more your wavelength. Just make sure you do some research beforehand so you end up with the vacation you want. While there is still some social unrest in Greece, the economic collapse has made the country much more welcoming to the broke student. Plus, by visiting and pumping money into the local economy, you’re actually helping them slowly get back on their feet. If you’re a fan of Greek food, or just always wanted to see the Parthenon but never had the money, now is the time to pay a visit. Another great European country you should definitely consider visiting is Portugal. Also here, due to the recent economic climate, the general costs of living have gone down noticeably, making it a more affordable location for people whose instinct would be to avoid western Europe for travel. The cities of Lisbon and Porto are by far the most popular destinations, the latter being the home of the port wine. If the usual sunset in Lisbon is anything close to the picture, that alone would be worth the trip don’t you think? If you want to relax on the beach, experience an interesting culture and perhaps learn some Spanish, all on a budget, Ecuador is an ideal location for you. If you’re worried about safety, Ecuador actually has very few instances of tourist targeted crime, and it’s general crime rates are not high enough to prove itself an actual risk to your safety. All this relies on your own behavior though—if you go out of your way and get dead-drunk without friends to look after you, or try to buy illegal substances, you are much more likely to be targeted. The Galapagos islands(picture) is by far the most popular destination, and with possibilities of views like this it’s easy to understand why. Uruguay is perhaps the most modernized of the South American countries, and often to referred to as the safest place to visit in South America. If you’re more interested in a city vacation than chilling on the beach, or want the best of both worlds, staying a few days in the capital of Montevido can be a great idea. Uruguay is a country that should definitely be on a backpacker’s bucket list. One interesting idea is to visit one of the local ranches called Estancia(picture). With many historical remnants of the Inca empire, one of the most fascinating civilizations in history, it’s hard to get more exotic than Peru. If you love experiencing the culture of times past and imagining what things were like, Peru is probably one of the most exciting places to go. But that’s not all it has to offer either. Peru is also a great destination for aspiring surfers on a budget, or people who want to experience traditional sightseeing and the beach life in one trip. While visiting Machu Picchu might be a bit upsetting for the budget, it’s definitely going to be food for the soul. It’s hard to write a list like this and not include India. Home to many of the most amazing historical monuments in the world, and some of the world’s most popular dishes(although you haven’t tasted real Indian food until you’ve been, as my friend keeps telling me) and one of the cheapest destinations for food and accomodation in the world, India is perfect for the bootstrapping backpacker. The only problem is that India is such a big country, you would have to write a separate post altogether to guide you in the right direction. Thankfully, there’s this list of best Indian destinations put together by Tripadvisor, arranged in order of users’ enjoyment. Now all that remains is to find a cheap flight, and be on your way.